April 24, 2017 — Comments are off for this post. We started working on Semplice originally around 2012 and launched it in 2014. Things were quite different back then and technology has evolved over time. So after three years of working and supporting the original Semplice we decided to start designing and developing everything from scratch. 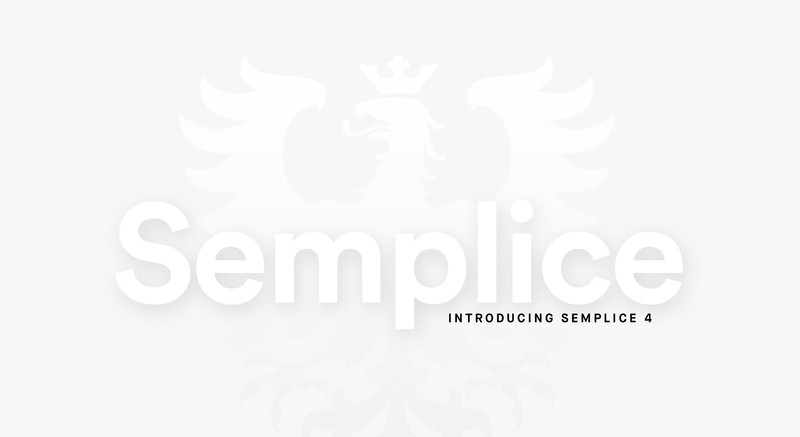 We call the new product Semplice 4. As you can imagine, doing this not only took us more than one and a half years to finish, but it also meant we had to make some compromises when it comes to supporting the old Semplice. Sadly, with the new Semplice we have to drop the support for the old Semplice (v3). What that means is: They're essentially two completely different products. IMPORTANT: Semplice 4 is not a free update, it is a completely new paid product. We collected some of the most asked questions below. Is the new Semplice 4 a free update? No, it's a new paid product. As you know, Semplice is not a subscription model but a one time payment product. Meaning, you purchase the software as it is, at a fixed one time fee and you can use it forever. SIMPLY PUT: It's how software used to be. For example, back in the days you would purchase Photoshop 6 and you can use it as long as it's running. If you want to get the new Photoshop 7 version, you can decide if you want to pay again, or just stick with your Photoshop 6 version. Semplice is just like that. And the good thing is, it's totally up to you, we won't force you. Does that mean my Semplice v3 won't work anymore? Of course not! That's the beauty of Semplice. It's yours and it still works. Your current Semplice version (version 3) will continue to run and you're free to use it as long as you want. And while the new Semplice (version 4) is pretty nice, you don't have to get it if you don't want to. We personally recommend you to only get it if you decide to build a new website from scratch or plan a big re-design. However, after 3 years we decided to not ship any new features for Semplice v3 anymore. Do you have discounted pricing for existing customers for Semplice 4? But I purchased Semplice just recently, do I need to buy again? That's a good point and we thought about that as well. We have special arrangements if you purchased Semplice after April 1st, 2017, because we feel with you and it's indeed a bit bad timing. So if you happened to purchase Semplice after April 1st. 2017 please reach out to us at help@semplice.com so we can help you. But I want new Semplice products for free forever! Sadly that is just not possible for us, we would simply be dead as a company. We've collected some information to our pricing model to make this a bit more clear. If you purchase Semplice, it means you buy the product as it is. We will make sure your Semplice version keeps running as long as possible, but we can't promise big new features forever. Thats why it's not a subscription, but a one time payment. We want to make sure expectations are set the right way. Is Semplice 3 and Sempice 4 compatible? No, Semplice 3 and Semplice 4 are two completely different products and are NOT compatible. Any pages or content created with Semplice 3 will not show up in the new Semplice 4.